Honda Big Red After Market Door Kit-Retail Value-$559.99-ON SALE NOW for $449.99! 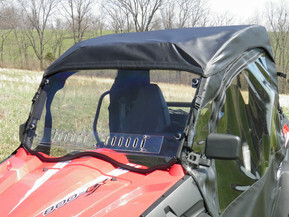 The Honda Big Red After Market Door Kit is used in conjunction with a hard windshield, top, and back panel. The unique design of the door kit allows a perfect fit with any clamp configuration. -Doors roll back when an open cab environment is desired. -Designed specifically to fit the Honda Big Red model. -Adheres to roll cage with heavy duty webbing and YKK hook and loop. -Manufactured using heavy duty fabrics for strength and durability. -Marine canvas fabric is water repellent, tear resistant, puncture resistant, mildew and UV resistant with less than 1% stretch or shrinkage. -Camo patterns are a heavy duty Cordura® nylon. This rugged fabric is made from Invista's™ acclaimed, patented high performance polymer, designed for superior strength and abrasion resistance. Coated with Polyurethane on one side for water resistance. This is the same fabric used to manufacture our military’s MOLLE systems. -The door windows are made of durable Aqua-View Smoked vinyl allowing for an uninhibited view and total clarity. -The doors open and close using YKK zippers manufactured using a state-of-the art injection technique and are attached to the strongest cord and tape made. The YKK zippers offer crosswise strength that's unmatched in the industry. -Installation kit comes comes complete with instructions and self-adhesive hook. -Marine Canvas-Top Gun 100% polyester. -Vinyl-Aqua-View 30 gauge smoked vinyl.